I switched things up a bit on this weekend’s newsletter. I’ll cover the Market first to help make your review more efficient. For our Premium and Early Warning members we have started off the year with some solid gains and look forward to adding to these moving forward. I attended a training webinar on Market Smith this weekend that was one of the best IBD trainings I’ve attended. What I learned combined with the training I at the end of 2014 will continue to building the quality and strength of my private watch list which will be updated on the website for all Premium and Early Warning Alert members no less than monthly. General Market Observation: Last week on every Index there was 4 up days into a resistance zone with Friday being a back track day. As I write this Trader’s Report the futures are down which opens the door for more of a pull back. There continues to be a divergence between the Daily and Weekly charts with the Weekly looking like more down side is in order. As we’ve seen through the first full three weeks of this year, price on every Index has moved from support to resistance and back twice. Each of these moves has provided quick tradable rallies and sell offs but no indication of a final decision that would lead to a longer term move. I found it interesting that Scott O’Neil mentioned for the first time that I’ve heard that the current Bull Market has now been going for over 5 years and that the market is need of a sell off to clean the slate and set up for the next uptrend which many believe will be a Super Cycle Bull Market! I agree the market’s need to clear the deck and wash out the current tired leaders but alas we don’t know when that will happen. Along with a heavy dose of earnings reports this week the Fed also meets and reports. The market reacted very well to the last meeting in December—but will it happen again. At some point more of the same will be seen as a sign of weakness and the market will react accordingly. Mix with this the high level of volatility currently and the January wild ride may continue! SPX: Friday price action hit resistance and sold off. Strong levels of support at 1990 and resistance at 2063 are in play. Until we break out either direction from these levels trades can plan trades in with Index ETF’s in either direction and exit as price approaches the opposite boundary. I know this is not the most ideal way to trade but the moves on the Index ETF’s, especially the leveraged ETF’s are in the 10%-15% range. A few years ago the market was stuck for a couple of months in one of these trading ranges. The action provide about 5-6 bounces from support during that timeframe which provided an excellent compounding effect trading the leveraged Index ETF’s. NDX: A bit stronger than the other Indexes as it price pushed up towards the late December highs. So there is strong resistance at the 4300 zone and strong support just below 4090. If we are stuck in a trading range then typical trade entry techniques of waiting for breaking trend moving averages may be less effected and even lead to a “meat grinder” effect because the moving averages are trapped between support and resistance. Friday’s candle is a spin top a close cousin to a doji which is a sign of indecision. When then take place at the end of an uptrend doji’s tell us that uptrend is tiring and that price needs to take rest or retreat. If price move back down to the 100 day SMA with velocity of momentum then this could be indicative an Index where the path of least resistance is down! RUT: Price finished on Friday with a Spinning Top Doji at the beginning of a resistance zone. 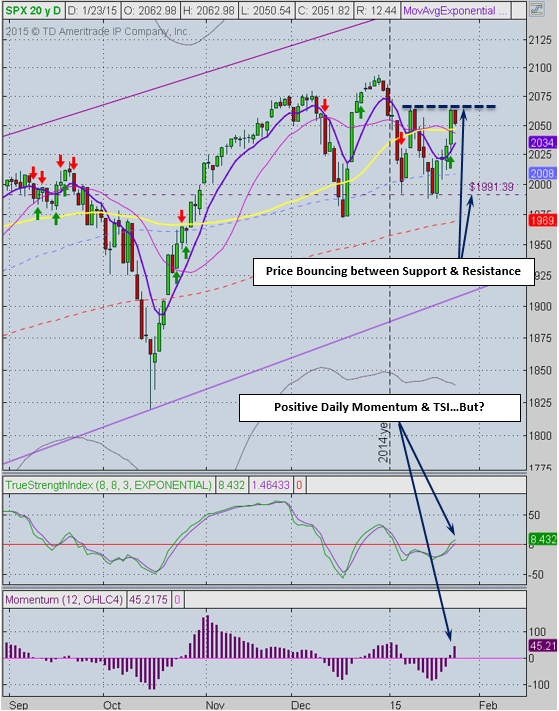 There is stronger resistance at 1200 and strong support at the 1150 zone. The 50, 100 and 200 day moving averages are almost moving in a horizontal direction which means there is no trend. This has been the theme of the Russell since the beginning of 2014. Remember though that trendless doesn’t mean unprofitable. With each of the Russell’s bullish bounces there has been excellent opportunities for profitable trades. Remember if you are a premium or Early Warning Alert member you can receive Text Alerts and Trade Notifications if you send us your mobile phone number. Sent us your number with NO HYPHENS please and we’ll get you on the Text Notification List. The Margin Account is invested at 6.5% currently. IBD show the Market in Confirmed Uptrend, but I’m seeing a mixed Market that could go either way in the short term. It will continue to be a market of stocks for the patient trader. ATTS Returns for past 3 Years—Each account is now reset to $100K to begin 2015! Updated at the beginning of each month. Outs & Ins: UA & VEEV both checked into the IBD 50 this week! VEEV is early in it move but need some volume to kick in so that Momentum gets behind the move. UA is also early in its move but will bump it’s head on resistance at the $73 level. This may be an earning run on UA and needs for the moving averages to catch up to last week’s move. Keep an eye on FLT because there was good volume behind the move from the 200 day SMA. Many of the stocks on the IBD 50 are extended but look pretty healthy and just need a proper entry action point set up. Another interesting candidate which just broke out is DLTR for a steady uptrend but not a barn burner. It is showing great volume. Comments and opinions written below this line of text may be provocative and only obliquely related to trading. Some may find these “Off the Wall” comments challenging to their outlook on life. I will not post any comments made on subject matter below this line, so if you disagree blast away. Off the Wall: It is kind of interesting to listen to Scott O’Neil talk about some of the lessons he learned from his dad through the years. One thing that really struck me from this weekend’s conference was how Mr. Bill O’Neil appears to like the Shake Out Plus 3 entries which is very close to the type of entries we like at Active Trend Trading. Another thing that was very clear is that by using this entry process, Mr. O’Neil was usually into position with an established profit by the time price action reached the appropriate breakout entry point. Because of this it sounded like Mr. O’Neil typically beats his fund managers. Hmmm…Is there a lesson here? Share Your Success: Many of you have sent me notes regarding the success you are having with the Active Trend Trading System. Please send your stories to me at dww@activetrendtrading.com or leave a post on the website. Thanks!